Made in Australia, Oceania, c 1850-1855. 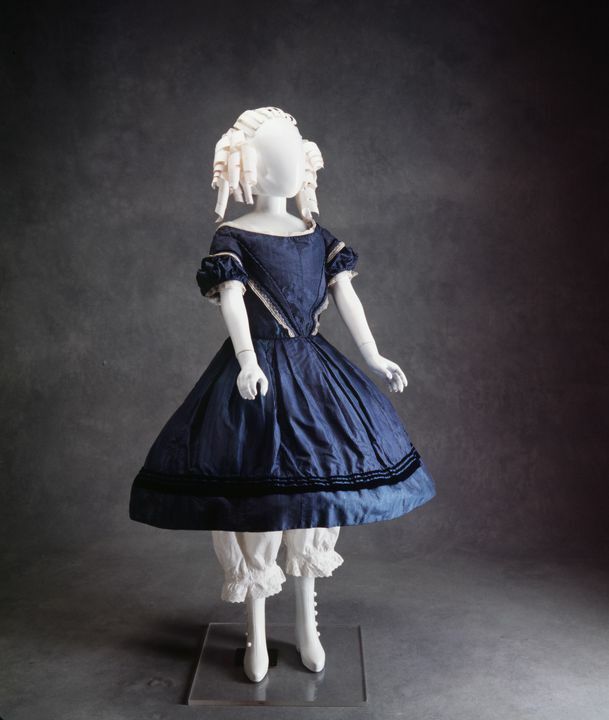 This girls dress, made from the fabric of another dress, is an exceptional example of how children’s clothing followed adult fashion during the early to mid-nineteenth century (1820-1860). Additionally, it illustrates the conservation of clothing in the colony and the common practice of recycling older garments to create something new and in style and at little monetary cost. Evidence of this practice is rare, making this costume a particularly interesting example of colonial dress. Girl's blue silk dress with white checks. The bodice is fitted with a high scoop neckline edged with lace. The sleeves are puffed and edged with lace. The flounce skirt gathers at a natural waistband and fastens with a hook and eye closure at the centre back. A pocket is sewn onto the right side of the skirt. The neck ties up with a black ribbon. Applied blue velvet ribbon lace and self trim at bodice from V outline at front and back. Skirt trimmed with 3 bands of blue velvet above hem. Piping at shoulders, waist, and neck. Lined with polished cotton. All handsewn. Outfits from this period would either be made by professional dressmakers or in the home. There was a plentiful supply of dressmakers as it was the one of the few areas open to the many women forced to support themselves. Many women and children worked long hours for low wages - a plight not dissimilar to that of outworkers today. By the 1850s a solution to the problem of obtaining a new cut emerged from the growing women's periodical press. Women's magazines began to complement their fashion prints and information with simple diagrams to help the readers sew the dresses illustrated. At first there were no insturctions for laying out, cutting, sizing, fitting or construction of the garment but by the 1870s full-size paper patterns with instructions were being offered in magazines. The fashionable women's dresses provided plenty of fabric for recycling into their children's clothes. Skirts, when plain, which was often the case during the 1840s, were made up of four widths of material drawn into the waist by means of organ pleating and when unpicked these unbroken, straight lengths were ideal for remaking.